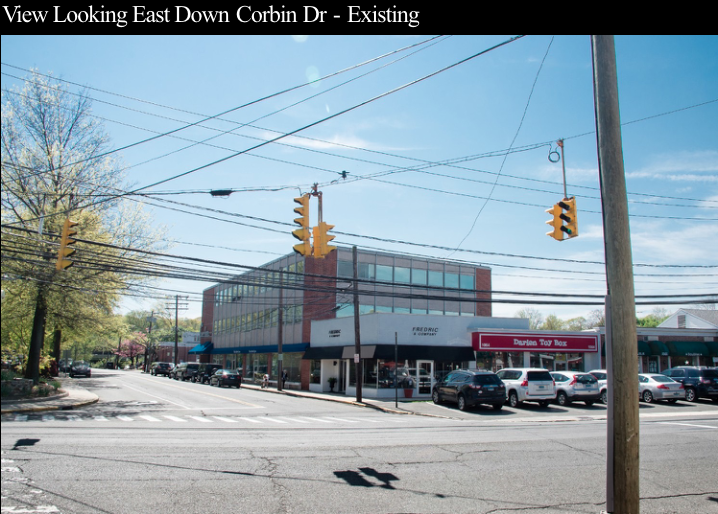 The Corbin Drive/Post Road redevelopment proposal would not include the back-office operations of the present Darien Post Office — just the public, front-end “retail” side of it in a 2,500-square-foot space, the Planning & Zoning Commission was told Tuesday. “We’re proposing to eliminate the distribution center for the Post Office, and have that Post Office move that elsewhere,” said David Genovese, principal (with his father, Rocco Genovese) at Baywater Properties, which has partnered with developer Penny Glassmeyer to propose redevelopment of the downtown block between the Post Road, Corbin Drive and Interstate 95. 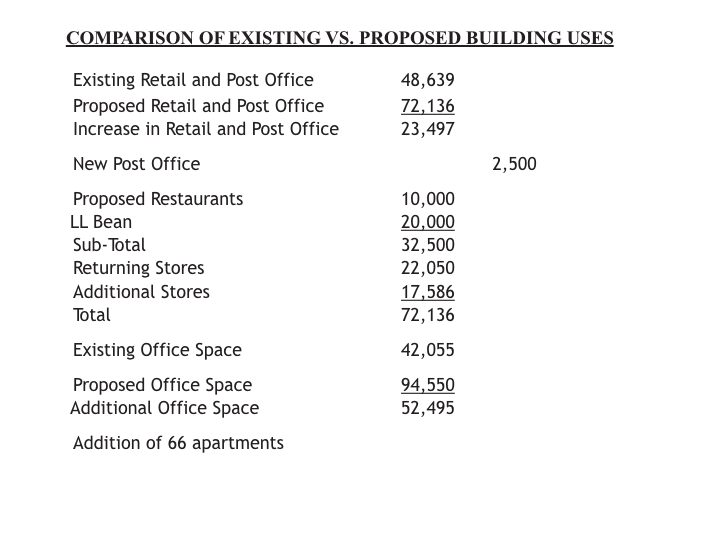 Genovese has said in the past that fitting in the non-“retail” parts of the Post Office, with space for storage, sorting and parking for delivery vehicles — would be difficult on the site, but if they couldn’t stay downtown, he would try to help find another location for those operations. The U.S. Postal Service has some distribution operations at its Post Office on Camp Road in Springdale, just over the Darien border. When the former New Canaan Post Office building was closed, postal employees from that town worked at the Springdale Post Office. Genovese spoke at a two-hour meeting of the P&Z Commission to present the proposal. Much of the presentation repeated past information and slide projections made at the initial description of the project last July and in presentations afterward, but the commission was also shown how the proposal has changed in response to statements from commission members and the public. The corner of Corbin Drive and the Post Road. The building here has been reduced to three stories, rather than four. A wider view of the building at the corner of Corbin Drive and the Post Road. The tallest building in the development would be along Market Lane within the development. It would face this plaza. The view down Market Lane, from about the middle of Corbin Drive, looking southwest toward I-95. The building with the copula faces the proposed Town Green. The developers are proposing zoning changes that would create within the existing Central Business District a “Corbin Subarea” that would allow a six-story building, 95 feet tall, on the site in return for public plaza space. Commission members questioned Genovese and others giving the presentation about the need for a building that high. The zoning change will be the subject of a second meeting scheduled for 8 p.m., June 21 in Town Hall Auditorium. At that meeting, the public is expected to be able to speak. The commission will then continue considering the zoning proposal. Once the commission votes on that, the developers will propose a site plan, which will have many more details on traffic, parking and building designs. Town officials have increased the budget for the Planning & Zoning Department to allow it to expand its staff to help with land-use decisions for three major commercial redevelopment projects in town — for this development together with the two projects proposed for the Noroton Heights business district. The highest building proposed for the project, an apartment building with its back to I-95 and its front facing a plaza, would have a sixth story and stand 95 feet high, making it the highest building in town. The height of buildings in the project has been one of the most controversial aspects of it, and a floor has been removed from the proposed building at the corner of Corbin Drive and the Post Road because of height objections. 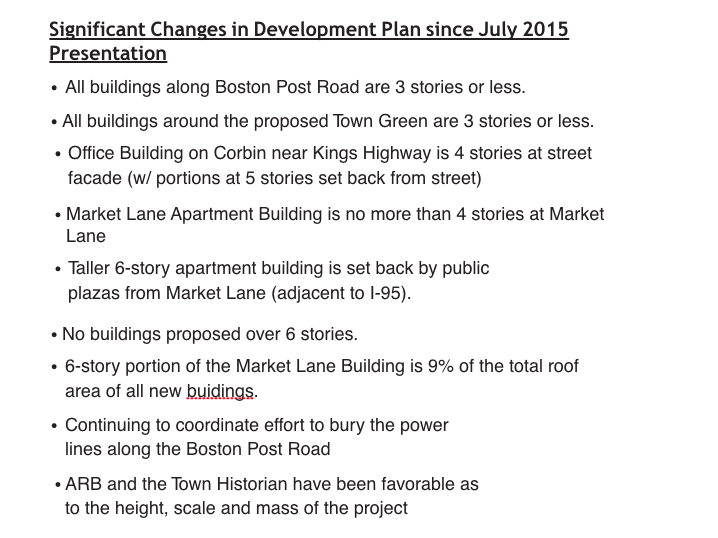 Genovese pointed out that all of the buildings proposed along the Post Road are now three stories or less. Overall, the proposal now has buildings of 355,000 square feet, which is 52,000 less than the 407,000 square feet initially proposed last year. 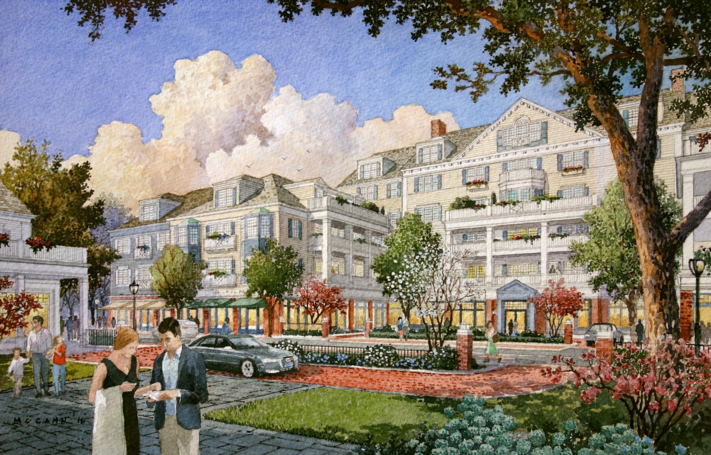 Attorney Robert Maslan of Darien, who is representing the developers, pointed out that the closest houses to the building would be across Interstate 95. 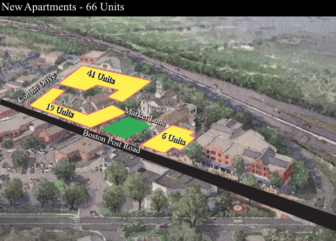 Genovese pointed out that in terms of roof area, the sixth story takes up only 9 percent of the total, and both pointed out that the higher stories would be well away from the Corbin Drive and Post Road public streets. Commission member Steven Olvany, who had asked similar questions of the developers of Old Town Hall Homes, asked Genovese and architect Gary Brewer of Robert A.M. Stern Architects about why it was necessary to have so much height for a six-story building. That leaves a lot of room between floors, Olvany pointed out. Brewer said the architectural details of the building were still being worked on (for the expected site plan proposal). Eric Silinsh, a senior associate and project manager for Robert A.M. Stern Architects, said the estimate of about 15 feet from floor to floor “just gives us a little bit of flexibility.” Maslan said the same. Olvany replied that it appeared to be a lot of flexibility. The matter is expected to be discussed at future meetings. A key element of the development proposal is on land that the Baywater Properties/PG Properties partnership does not own and won’t own: The current owner of the Bank of America building and lot — where a major “anchor” tenant, identified as L.L. Bean, would be located — is retaining ownership of it, Genovese told the commission. A list of changes was included as part of the Tuesday night presentation. The proposal includes a vast, two-level undergound parking garage beneath essentially the entire site, with spaces for 750 vehicles. In the latest description, the vehicle entrances to the garage would be limited to two locations — on Corbin Drive (close to where the Post Office now sits), and on the Service Drive that would run parallel to the highway. There would be numerous pedestrian entrances, including one at the corner of Corbin Drive and the Post Road. In order for people to figure out where to park and how to get to various stores, there will be lots of signs in the garage, Genovese said. Residents of three apartment buildings, with a total of 66 apartments, would have their own, reserved undergound parking. 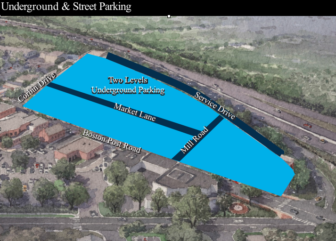 The proposal doesn’t include any expectation that people using the site would park elsewhere in town, so it isn’t supposed to create any additional strain on parking elsewhere. But shoppers are expected to park somewhere downtown and walk around. The 66 apartments would be located in buildings at these spots. More parking spaces are planned than would be required under zoning regulations, and Genovese said he doubts they will all be used. Building underground parking is expensive — both to remove soil and rock and to seal walls and floors to prevent flooding. Genovese said his friends have suggested that he wait to develop the site because technology in the near future — self-driving cars or something like Uber driver services (or even a combination of the two) — may make larger garages obsolete. But he said that after working on buying the land and developing plans for more than 10 years now, he didn’t want to wait any longer. Commission Chair Susan Cameron said street-level parking is much more popular with town residents. Commission member John Sini suggested that more parking might be made available on streets if the proposed new ones (which would be private, not public roadways) were one-way. Genovese said the developers would look into that idea. A major goal for the site is to show different buildings that look like they were constructed over time, with somewhat different styles, said Gary Brewer, an architect with Robert A.M. Stern Associates. But the Town Green part of the site is an exception to that. There, two “sister” buildings on ether side of the Green (as seen from the Post Road, or from the opposite side of the Green) would be essentially identical. 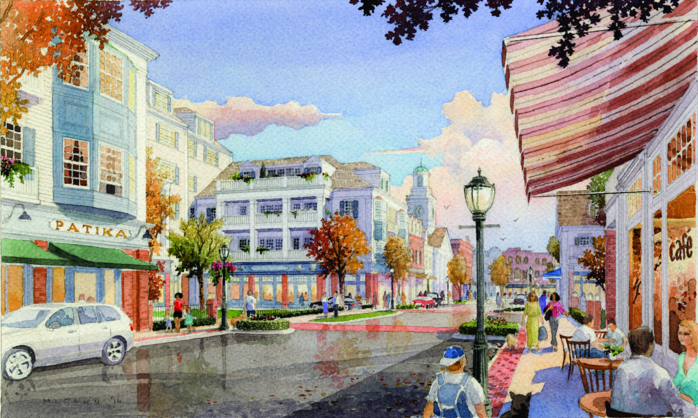 A separate plaza on the site has arms of a larger building that also appear identical in the renderings. Brewer said after the meeting that the buildings are meant to balance each other. That’s a typical feature of architecture aiming for a “classical” look of balance and harmony. Uniform symmetry isn’t a typical feature of most New England town greens, although this “Town Green” may be more of a public plaza than a green, and uniform symmetry is common for plazas of institutions, including larger plazas at St. Peter’s Square in the Vatican and Thomas Jefferson’s design for the University of Virginia. The green would be rectangular — 120 feet wide, along the Post Road and 140 feet back from it. 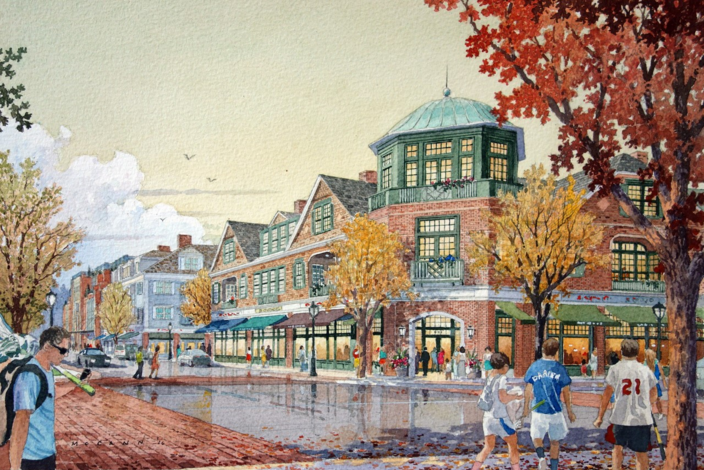 It might be a location for the Darien Farmers Market, art shows, outdoor movies, an ice skating rink in the winter or concerts that wouldn’t be too loud, Genovese said. It might become a public space where people would gather after major public tragedies, he said. The proposal asks for the ability to hold performances in the venue without getting permits from town officials for each one. The developers have an interest in keeping tenants happy at the site, so nobody should expect too much noise Genovese said. 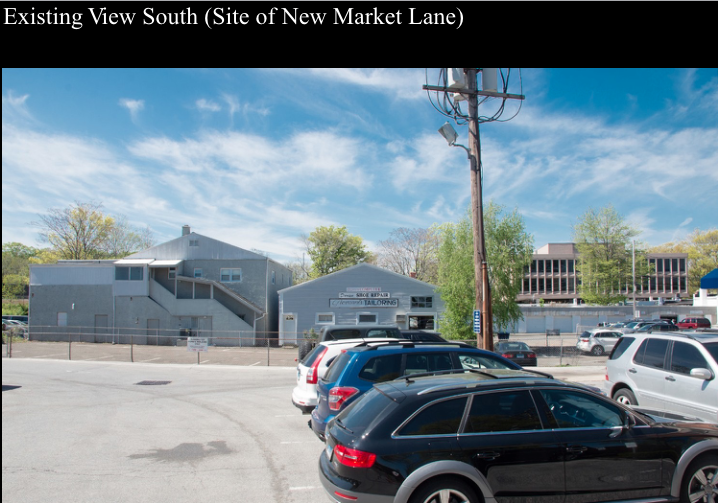 The building at the back of the Town Green, facing the Post Road, might have an interior market something like Quincy Market in Boston, where individual vendors might sell items, Genovese said. 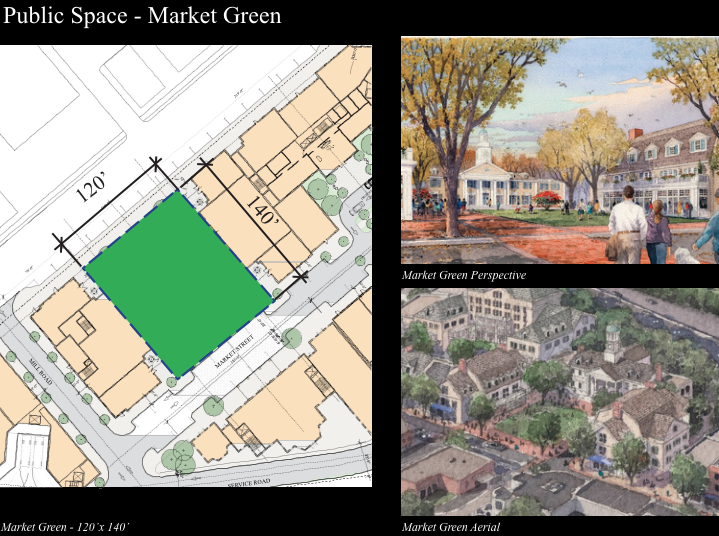 Restaurants would face the green from each of the sister buildings, and although Market Street would run between the green and the central building facing the Post Road, there would be no side streets on either side of the green. The Architecture Review Board has looked at the Corbin/Post Road proposal and doesn’t have major objections to its scale or mass, Genovese told the commission. About half the stores in the existing 48,639 square feet of retail space now on the site have expressed an interest in returning to it when the new project is built, Genovese said. “Contractually, we have an obligation to provide space on the same terms as their existing leases, subject to renewal rights,” he said. Any rent increases were not expected to be large, he said. Toy Box of Darien, Everything Is Rosey, Spree and Wiggles & Giggles have been among the stores that want to return, he said. From the presentation Tuesday night. For the rest of the stores, who are not interested in returning, roughly 17,000 square feet of space would be freed up, he said. You can put about 10 stores in that space, he said. Two or three additional restaurants or food-serving establishments are also expected to go in (including two facing the Town Green). The large anchor store near Exit 11 on the site would also be an addition. Overall, out of 48,639 square feet of retail now on the site, about 23,000 square feet would be added, for a total of about 72,000 square feet. Genovese has proposed that his proposal for 12 units of housing for developmentally disabled adults on East Lane (a short street near the entrance to Interstate 95 off of Old Kings Highway North) be used as affordable housing, a state-mandated component of any new housing development. Genovese said the state’s financial problems are endangering the East Lane proposal because the state could find it difficult to subsidize rents for the units. He added that state officials have said they’re wondering if 12 units in two buildings, as proposed for East Lane, isn’t too concentrated for one site, even with at least one staff member in each building at all times. Statewide, there are roughly 2,000 developmentally disabled people on a waiting list for subsidized, monitored housing, a situation that the East Lane proposal is meant to help alleviate. Genovese said discussions are continuing between Baywater, STAR Lighting the Way (which would staff the site) and state officials. The proposal envisions buried electricity, telephone and cable television lines to remove the unsightly wires from view. Genovese said talks about that are continuing with Eversource (which, separately, is selling all of its utility poles in Darien to the town government). “That’s a very expensive proposition,” Genovese said. But he added, “It just makes for a more pleasant experience, visually, as a pedestrian.” He pointed out that on Grove Street, built by Penny Glassmeyer, power lines have been buried. 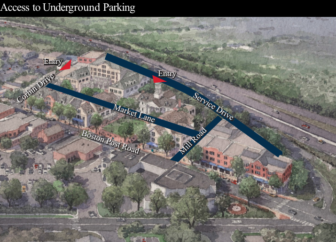 “We’re going to be pulling people off the Post Road, giving them a place to park,” and giving them a good walking experience so that they’ll want to walk to various stores and possibly restaurants, he said. Here’s the Power Point presentation of the proposal, with all the slides. Planning & Zoning Commission 5-31-16 from Darien TV79 on Vimeo. Baywater Corbin Partners has reapplied for zoning approval to redevelop the Corbin Drive/Post Road/I-95 tract of land downtown, this time lowering the proposed height of its tallest building to 69 feet, with five stories. Baywater Corbin announced the new proposal late Thursday afternoon in a news release (full text below).